IMH "Iraqi media house" has observed during the second monitoring report, informative materials call for incitement against Iraqi journalists on the backdrop of their cultural and political attitudes. While the applicable Iraqi law had set a definition for incitement, as "A creation of a crime's idea, then strengthen the idea until it turns into Intention to commit the crime''. The Incitement is any intentional activity aims to encourage individuals or groups to commit an act that leads to a crime; And the Iraqi criminal code/ article 198, sets that "Any person who incites or encourages to commit a crime by physical support, or financial assistance without the intention to participate in its commission, will be punished by jailed for not more than 10 years''. Since 2015 onset, some Iraqi journalists, and political and cultural activists have received 'advertisements' and press materials that expose directly incitement to violence and clear repression for freedom of expression. Journalist 'Afrah Shawki', the correspondent of 'Middle East' newspaper in 'Baghdad' had experienced a form of public incitement, on the backdrop of a published Reportage about black banners, mourns participants of popular crowd forces. The Middle East newspaper has published on its issue which dated on the 18th of January 'Shawkis's' report which was titled "Obituary banners ... another manifestation of the proliferation of armed militias in Iraq (...) hoisting them in public places in Baghdad raises reservations of some audience". According to the report, 'despite previous calls to Iraqi Interior Ministry to bear arms within the government power, and prevent armed manifestations and their linking to systemic state forces, as threats that the country is facing provided a fertile ground for the re-appearance of armed militias, and establishment of boards and mass official mourning for their dead, while Baghdadis are complaining the growth of influence and control of these militias on government forces account'. But the Middle East reporter, posted on her "Facebook" "there is a confusion caused by my use to the word 'militia', which is a professional use, because the definition of militia is the force that carries weapons apart of state framework, and supports the country and army." In January the 25th, the TV channel, "Iraq now," broadcasted series of advertisements directed against Iraqi journalists, in which included terms and expressions that enticing explicitly, on backdrop of some view points and attitudes about targeting 'Charlie Hebdo' French magazine. According to the channel announcement, a report titled ''Ziad Ajili' [an interviewer, and director of the journalistic observatory freedoms] says that the images depicting Prophet Mohammed is a freedom of expression'. Also, it adds 'Ajili's wife 'Amal Saqar' [a journalist at Radio Monte Carlo], conducts interviews with him for sake of solidarity with the French magazine that offended the Prophet’. The report went, referring to 'Saqr', saying 'The Palestinian [Amal Saqr] says that Iraqis are demonstrating to support the French newspaper 'Charle Hebdo' and its abusive caricatures', and Amal's husband had demanded journalists to bless that newspaper. Another announcement for the same channel 'Iraq Now', stated that 'journalists and citizens appeal to the Prime Minister 'Haider al-Abadi' and the Prosecutor to move the lawsuit against ‘Ajili’ and his wife'. The channel also had inflicted the lawsuit by saying that ‘'Saqr' says that militias threaten and horrify cartoonists, and they attack newspapers, by IEDs’. And later on, that channel published a new declaration in which attacked journalists and opinion makers on the backdrop of solidarity with their colleagues who have been included in incitement. According to the announcement, ‘we won’t allow in Iraq, [the land of prophets, saints, and righteous] humiliation of our holy places by delinquent guys such as Heretic Ali Wajeh [Iraqi journalist], and his pseudo intellectuals fellows who wear secular robes to pass an outright disbelief. In the January the 6th, 'Buratha News' had published an article entitled "When media lose ethics, 'Adnan al-Tai', as a model'; the article was written by a cleric called 'Sheikh Abdel Hafez al-Baghdadi al-Khuzai'. Also other websites took the same context, like 'Nasiriyah today' which published an article within the attack campaign that started against 'Adnan Al taie' [a broadcaster in 'Dijla' channel], on a backdrop of an argument about 'Basra province' file, through a talk show that he runs, that article has accompanied with threat campaign promoted by social networking sites against 'Taie', on charges of abuse to "Basra". According to the article, " When your Saddam came to Basra, he visited a house, and you were at that time on the second line of media choir, and he was in president of the republic position, Basra's people had offered him a luxury lunch, which neither he nor you have ever knew before'. 'Al Taie' has explained by a tweet on the social network the misunderstanding that happened. He said ‘I have not offended people of Basra at all, what I said is, why would we accept [Basra territory] idea and they share with us provincial language, culture, and traditions, while Kurdistan differs in language, customs and so on .., some friends became angry, some was resent, some felt ashamed, and few of them got what I meant and did not find in my speech any transgression’. 'Al Masalla' site had previously published a report on the 10th of December, entitled "Karbouli [Sunni politician] converts 'Dijla' channel into a platform for oblique clerics, and claims for his apology from religious authority", the report had also criticized the broadcaster 'Adnan al-Tai’ and said he was "winking against popular crowd forces"; The article has been submitted with the following sentence 'the presenter said at the beginning of the dialogue that 'Al Sarkhi' [Shia cleric] and his followers have been subjected to persecution by Iraqi government and security forces’; and It is known that accusing a journalists of exposure to 'religious authority', or 'popular crowd forces', like what happened to 'Shawki' the middle east newspaper correspondent, puts them in risk, as it affects their lives and security because of mixing press coverage with religious considerations in our society, and such charges through the media, represents a pattern of incitement. Iraqi local advertising media had released press materials included padded incitement, or clearly stated as advertising messages directed to a divided audience in a political and security timing prevails upon it a religious and sectarian intolerance. Overt incitement affects a number of recipient public's reaction, which may end up by committing crimes, and law experts classify "incitement" into 'individual or personal', and 'general or public', which is directed to publics by means of the media advertisements, and it's characterized as dangerous, because it's directed towards unlimited number of audiences. And according to the Iraqi legal applicable provisions, the term 'overt' is popped whenever a subject is linked with inciting crimes. 'The overt' is also: 'saying or shout that has been spoken out and repeated in such places mentioned in the previous item, where it is heard by audience who have no role in its use'. Iraqi law also refers to the overt means, as the "press, other publications, and means of advertising and publishing, writing, drawings, photographs, badges, and movies that are being published in the previously mentioned public places, or distributed, or sold to people everywhere'. IMH 'Iraqi media house also has recorded in this report serious observations about the absence of professional work and ethical regulations in the newsrooms and the media production sources in Iraq. As the report notes, the absence of dependent legal experts in press and media organizations, in order to be consulted to prevent the dissemination of texts and information products that may contribute in incitement on crimes, or may make responsible for its production a partner in the potential retaliatory as a response actions by individuals or groups of audience. 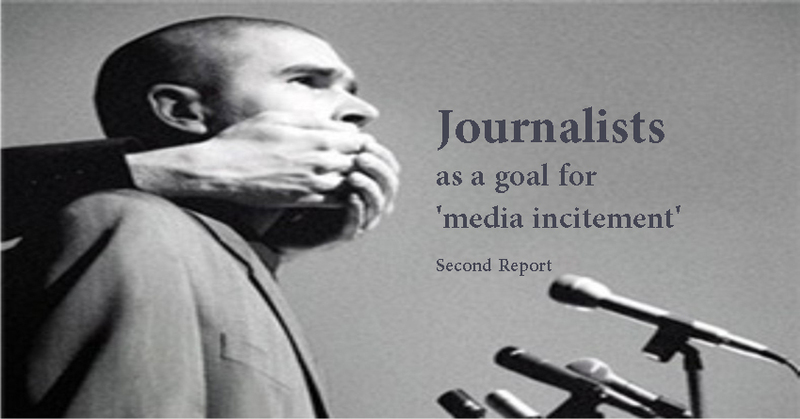 And finally, the IMH emphasizes that 'exploitation by journalists of their professional role as representatives of publics for personal reasons, or incitement aims and overt verbal targeting, is a form of 'confidence belittle' that given to them by the audience.